A new software by Fujitsu solves communication problems in meetings attended by hearing and hearing impaired members. The software called LiveTalk is designed for meetings involving multiple people sharing information. The tool basically uses speech to text conversion software to convert whatever the speaker is saying into a readable text in multiple computer screens. This helps people with hearing impaired to read whatever the speaker or another participant of the meeting is saying on their screens. Not only this software helps hearing impaired even otherwise for taking minutes of the meeting will become easier, so that whole conversation is converted into text format. LiveTalk is designed to have smooth two-way communication, with built-in functions for text input . Tools such as this will empower hearing-impaired to response immediately and participate in the meeting without any impediment. 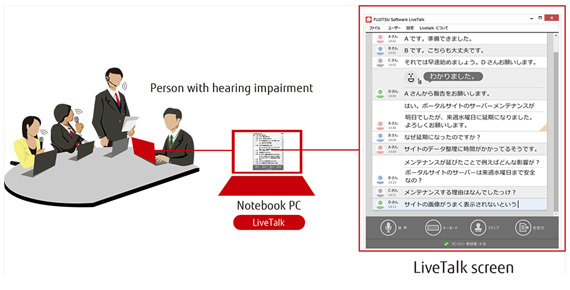 LiveTalk is developed and commercialised by Fujitsu Social Science Laboratory. The application is more significant in education where students with hearing impaired can advance in their education as good as other normal hearing capability. The software was developed with a 2013 grant from the Japan's Ministry of Internal Affairs and Communications . The technology enables text-based communication, as speech is converted into text and displayed on PC screens in real time with speech recognition using handheld and headset mics. Even if multiple people speak at once, the text conversion is processed in parallel and displayed simultaneously, making it possible to accurately grasp the flow of a conversation. If there are any mistakes in the conversion of speech into text, they can be corrected on the PC. Text is transmitted in real time to all PCs connected to a given wireless LAN router environment. The software can also be used on tablet computers. In addition to keyboard input, through the input of easily understandable emoticon stamps and preregistered, frequently used, fixed phrases anyone can comment quickly. For recording the meeting/conversation as a log file, Fujitsu said it will bring that feature in the next version of the software. Fujitsu has not disclosed on what all the languages and accents this tool supports other than Japanese. Price: This software is set to be sold in Japan for JPY 200,000* for 1 set (5 licenses). And this price excludes price of PCs, speech-recognition software, microphones, and wireless LAN router. LiveTalk uses AmiVoice SP2 speech-recognition software from Advanced Media, Inc.